Sharon Otieono Murder - Will Court Free Obado Today? 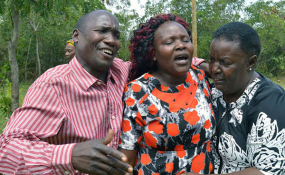 The mother of slain Sharon Otieno, Melida Auma (centre), is comforted by her relatives at their home in Magare village, Homa Bay County (file photo). It has been about one and a half months since the 26-year-old Sharon Otieno was abducted and her lifeless body found in a thicket in Oyugis. On Thursday, she returned home in a brown coffin. Her mother Melida Auma fainted after being overwhelmed by emotion as the body arrived at their homestead. Not even the ones who had braced themselves to comfort her managed to catch her in time. She jumped several times, yelling, her body shaking in sorrow before collapsing. For more than an hour, relatives tried to make her regain consciousness. Not even the heavy rain that pounded the area could keep away the mourners away. To them, nothing mattered than mourning their daughter. Mr Douglas Otieno, Ms Otieno's father, was composed and walked around his compound quietly. He preferred to be left alone and only shook his head when the Nation team approached him. The Rongo University student's body arrived at their Magare home at 4pm. Friends, relatives and other mourners had travelled for over 50 kilometres to Med25 International-Kenya Hospital Mortuary in Mbita constituency to pick the body. The body was transferred from Rachuonyo Level Four Hospital in Oyugis over security concerns about a month ago. "This is heavy for us. We will bury our daughter, but nothing will make us forget this pain. Every time I view her body and see what her killers did, it angers me. They were merciless," he said at the mortuary. He added that words cannot express the family's agony, no wailing can heal their hearts and no amount of tears can describe their loss. In accordance with Luo traditions, Ms Otieno's body was brought home for an overnight stay and will be buried at her grandfather's homestead, next to the grave where her foetus was buried. Mr Otieno had earlier said the decision to finally prepare for the burial was informed by the belief that their daughter will get justice. "We have seen suspects connected to her murder arraigned in court. We are happy with the investigations so far and believe her killers will pay for their crimes," he said. The family had vowed not to bury Ms Otieno until her killers are brought to book. Her seven-month old foetus was buried three weeks ago. Key suspects in the murder - Migori Governor Okoth Obado, his personal assistant Michael Juma Oyamo and Migori County Assembly Clerk Casper Obiero - have denied murdering Sharon and her unborn child in early September. They are still detained awaiting determination of their bail application whose hearing was set for October 24. Mr Obado fell ill at Industrial Area Remand Prison and is receiving treatment Kenyatta National Hospital.